Mapping out your career path or plan can at times feel like a daunting and overwhelming process. However, it doesn’t have to be thanks to the career planning checklist from Microsoft. This beautifully created career planning checklist lays out all the important information you’ll need as you decide what it will take to get to where you want to be. To help you get started in your search for your new career, the Microsoft career planning checklist is available to you at no charge. Simply click the download link found on this page to get started. 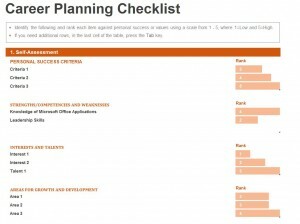 The career planning checklist is a neatly made Microsoft Excel template. As you go through the template, you will rank each item against personal success or values using a scale from 1-5. One will be low and 5 will be the highest on this particular scale. Within each category is a set of questions you will answer using the 1-5 scale. For example, in the “Self-Assessment” category, you will use the scare to determine your personal success criteria, strengths and weaknesses, interests and talents, and areas for growth and development. You will use the scale and repeat the process throughout the duration of the career planning checklist. It’s important to note that you can review and update the career planning checklist as you continue to grow in your personal and professional development. The career planning checklist can also be altered as your goals or plans change. Take the first steps toward landing your dream job with the career planning checklist from Microsoft. Download the career planning checklist template for free and get started today!